Largest city in the state of Louisiana, which passed into the possession of the United States in 1803. Among its earliest Jewish settlers were Jacob and Judah Touro, the latter of whom fought in defense of the city, under General Jackson, in 1815. His philanthropies extended all over the United States and gave rise to some of the most important institutions in New Orleans and elsewhere. Alexander Isaac, Asher Phillips, Abraham Labatt, Bernard Cohn, Ezekiel Solomon, and Gershom B. Kursheedt also were among the earlier settlers. The first Jewish institution seems to have been a burying-ground, which was located just beyond the suburb of Lafayette and in the parish of Jefferson; it was established by the society Shaaray Chased, from which sprang the first congregation; the first interment took place on June 28, 1828. The Jewish population of New Orleans came from various regions—Germany, Holland, England, Jamaica—and was increased by migrations from Charleston, S. C., Cincinnati, Ohio, and Baltimore, Md. By 1830 the community had attained a considerable degree of prosperity. It early entered into relations with Texas, upon the development of which it exerted an appreciable influence. 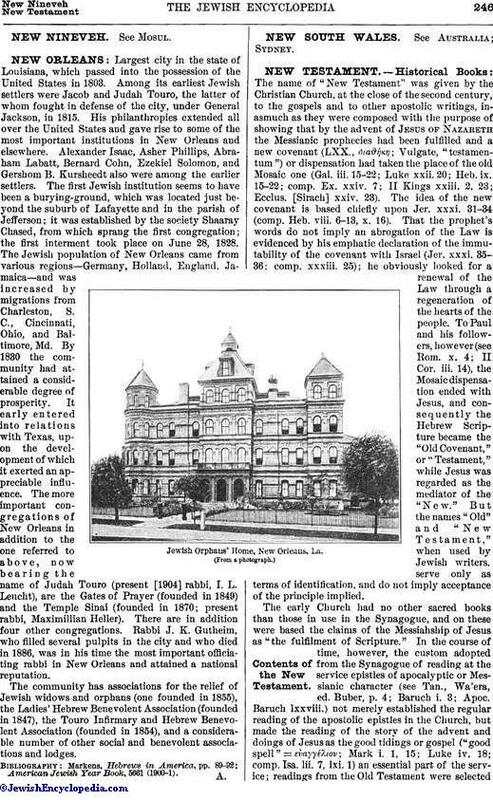 The more important congregations of New Orleans in addition to the one referred to above, now bearing the name of Judah Touro (present  rabbi, I. L. Leucht), are the Gates of Prayer (founded in 1849) and the Temple Sinai (founded in 1870; present rabbi, Maximillian Heller). There are in addition four other congregations. Rabbi J. K. Gutheim, who filled several pulpits in the city and who died in 1886, was in his time the most important officiating rabbi in New Orleans and attained a national reputation. The community has associations for the relief of Jewish widows and orphans (one founded in 1855), the Ladies' Hebrew Benevolent Association (founded in 1847), the Touro Infirmary and Hebrew Benevolent Association (founded in 1854), and a considerable number of other social and benevolent associations and lodges. American Jewish Year Book, 5661 (1900-1).